Posted on 4, March 2016 by EuropaWire PR Editors | This entry was posted in Automotive, Germany, Marketing and tagged cabriolets, Mercedes-Benz, Retro Classics in Stuttgart, roadsters. Bookmark the permalink. STUTTGART, 04-Mar-2016 — /EuropaWire/ — The dream of open-top driving is closely linked with the 130-year history of the motor car. Sporty roadsters and luxurious cabriolets from Mercedes-Benz play a pivotal role in this respect. At the Retro Classics the brand is presenting an exquisite selection of open-top vehicles sporting the three-pointed star. The Mercedes-Benz Classic stand picks up on the theme with its intricate, airy architecture while consummately showcasing three classic vehicles and two new Mercedes-Benz models. The Mercedes-Benz Classic exhibition area in Hall 7 also provides a stage for the “ALL TIME STARS” on offer for sale, along with numerous Mercedes-Benz brand clubs. The 16th Retro Classics will be held between 17 and 20 March 2016 at the Stuttgart exhibition centre. Stuttgart. Mercedes-Benz will be attending the Retro Classics in Stuttgart, offering visitors a journey through time in the fascinating world of the brand’s cabriolets and roadsters. The exhibition covers everything from the 300 SL racing sports car (W 194) from 1952 and the classic sports car 300 SL Roadster (W 198) from 1957, the 190 E 2.6 Cabriolet prototype (W 201) from 1990, to the new SL (R 231) and the recently premiered C-Class Cabriolet (A 205). The 300 SL racing sports car (W 194) and the 300 SL Roadster (W 198) bear testimony to the successes of the 1950s and the SL legend. The racing sports car stands for the overwhelmingly successful return of Mercedes-Benz to motor racing in the 1952 season for the first time after the Second World War. The vehicle proved an outright winner, securing impressive double victories at the 24 Hours of Le Mans and the Carrera Panamericana in Mexico. The racing sports car also gave rise to the famous standard-production “Gullwing” 300 SL (W 198) from 1954, which made its debut in spring 1957 in the open-top variant, the 300 SL Roadster. Together with the 190 SL (W 121) launched in 1955, the 300 SL Roadster started the tradition of open-top Mercedes-Benz standard-production sports cars with the magical abbreviation SL, which the new generation of the SL (R 231) propels forward into the future. A glance back at 1990 reveals how the Mercedes-Benz development department was toying with the idea of producing a cabriolet to join the compact saloon (W 201). The original prototype on display at the Retro Classics is the road-going result of these deliberations. 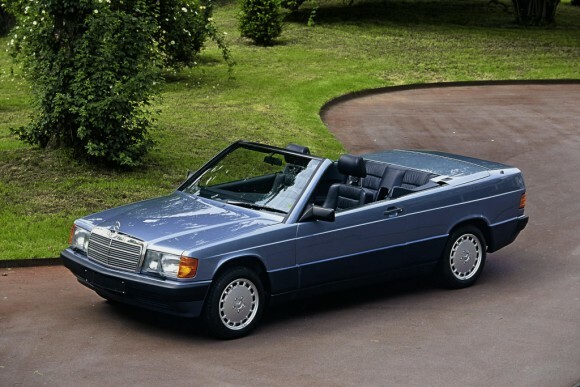 Even if the open-top “Baby Benz” did not enter series production, the study was a key decision-making aid for the 124 series Cabriolet unveiled in 1991 and today ranks among the forebears of the new C-Class Cabriolet (A 205). The ALL TIME STARS (http://alltime-stars.com) from Mercedes-Benz Classic have their own stand in Hall 7 at the Retro Classics. The high-quality Mercedes-Benz modern classics and vintage vehicles on offer for sale reflect the huge diversity of the brand’s vehicles over the ages. The line-up features all cars made by Mercedes-Benz and the predecessor brands. The focus is on classics that are suitable for everyday driving. Maximum transparency was the guiding principle behind their selection: the Mercedes-Benz Classic experts subjected each vehicle to a comprehensive 160-item checklist. The classics are categorised into three editions that describe their condition and authenticity: the Concours Edition includes modern classics and vintage vehicles in rare original condition with low mileage and vehicles that have been carefully restored by the Mercedes-Benz Classic experts in Fellbach/Stuttgart. The Collectors Edition comprises vintage vehicles and modern classics that are in excellent condition both technically and visually. Their patina gives them a particularly special character. The Drivers Edition is aimed at individuals looking for vintage vehicles and modern classics suitable for everyday driving and for people who enjoy working on cars. These cars are in good technical condition but still offer potential for further restoration work. The Stuttgart exhibition centre will once again be the place to be for classic car enthusiasts from 17 to 20 March 2016. The 16th edition of the Retro Classics is setting new standards for the world of classic cars. The organisers responded to the success of the past few years by increasing the exhibition space to around 125,000 square metres. 2015 alone saw more than 85,000 visitors attend the Retro Classics along with over 1500 exhibitors. Retro Classics 2016 starts on 17 March with a preview day from 11 a.m. and finishes later that day with the “Retro Night” (7 p.m. to 10 p.m.). On 18 March, Retro Classics is open from 10 a.m. to 7 p.m., and from 9 a.m. to 6 p.m. at the weekend (19 and 20 March). 300 SL was the designation of the competition racing car from Mercedes-Benz with which the brand returned to international motor racing in 1952 for the first time after the Second World War. Following the triumphant double victory in Le Mans and the previous double victory at the Bern Grand Prix, the 300 SL also won the two other races where it had lined up on the grid. The 300 SL took the top four places at the Nürburgring Great Jubilee Prize in the weight-reduced roadster version, while the Carrera Panamericana, a gruelling endurance race covering more than 3100 kilometres through Mexico, saw the car finish with a double victory. Karl Kling and Hans Klenk took first place in Mexico despite colliding with a vulture that smashed through the windscreen during the race. Even if the successful racing sports car was not sold to the public, it did light the fuse for the development of the subsequent Mercedes-Benz SL, which was launched at the end of 1953. Mercedes-Benz unveiled the 300 SL Roadster as the successor to the 300 SL Gullwing Coupé at the Geneva Motor Show in March 1957. On a technical level, the open-top sports car was very like the Coupé, although the modified space frame allowed the installation of conventionally attached doors, which were necessary for open-top driving. The suspension was likewise modified: the single-joint swing axle with lowered pivot point on the 300 SL Roadster was equipped with a compensating spring for the first time. From 1958 onwards, the Roadster was also available with a detachable coupé roof. It was from the standard-production 300 SL Roadster that the Mercedes-Benz engineers developed the 300 SLS racing variant with which Paul O’Shea won Category D of the American Sports Car Championship in 1957. Production of the 300 SL Roadster was discontinued after seven years in 1963, during which time precisely 1858 examples of the highly exclusive sports car were built. Following the facelift of the Mercedes-Benz W 201 series, which was unveiled in 1988, the brand turned its attention to a cabriolet. The result was a road-going prototype, which stood out with its four fully-fledged seats and enhanced body with subtly higher, slightly more angular rear where the large folding top was concealed under a metallic lid. The two-door cabriolet also boasted an elegant side line even with the roof closed. The car ultimately failed to make it into series production, yet the study served as a decision-making aid on the way to the larger 124 series Cabriolet, which was launched in 1992 and was among the forebears of the current E-Class Cabriolet. The compact cabriolet prototype features a 2.6-litre six-cylinder engine in tune with the sporty, exclusive aspirations of the open-top two-seater. This powerplant has been available in the 201 series since 1985, propelling the most powerful model in the compact class after the “V16 engine”. The new C-Class Cabriolet will be premiered at the 86th Geneva International Motor Show in early March 2016. It is the first standard-production cabriolet in the history of the Mercedes-Benz C-Class, which started with the W 201 (“190”) in 1982. The Cabriolet is closely related to the C-Class Coupé (C 205) whose silhouette it adopts along with the striking front end featuring a diamond radiator grille, LED High Performance headlamps, long bonnet and high beltline. The soft top with glass window transitions harmoniously into the distinctly styled rear end with its highly sporty look. With a capacity of 360 litres (285 litres with the roof open), the boot is capable of holding an exceptional amount of luggage for a cabriolet, thus offering high everyday practicality. Inside, the C-Class Cabriolet with its high-quality materials provides a fresh, sporty reinterpretation of the interior of the C-Class Saloon. Added to which are extensive assistance systems tailored to safety and comfort – through to solutions for semi-autonomous driving. The automatic AIRCAP draught-stop and the AIRSCARF neck-level heating are available as options. Altogether eight different engines are available for the market launch in July 2016, including two diesel models and the C 43 4MATIC Cabriolet as the top-of-the-line model. The R 231 series SL with its advanced technology and new styling was premiered at the Los Angeles Auto Show in November 2015. The facelifted Roadster is due to be launched in April 2016. It marks the continuation of Mercedes-Benz’s unique tradition of elegant sportiness, which began with the motorsport-inspired 300 SL in the 1950s. Compared with the first version of the R 231 unveiled in 2012, the new SL boasts an even more dynamic design and more powerful engines. Furthermore, the 9G-TRONIC automatic transmission, DYNAMIC SELECT with five transmission modes and Active Body Control with curve tilting function elevate the Roadster’s ride comfort and sportiness to new levels. The roof, which can now be operated at speeds of up to 40 km/h, and the automatic boot separator are further convenience features which make the luxury sports car even more of a pleasure to drive. Mercedes-Benz 190 E 2.6 Cabriolet, prototype (W 201, 1990).